Here's your chance to win a $25 gift certificate to the ITS Tactical store! 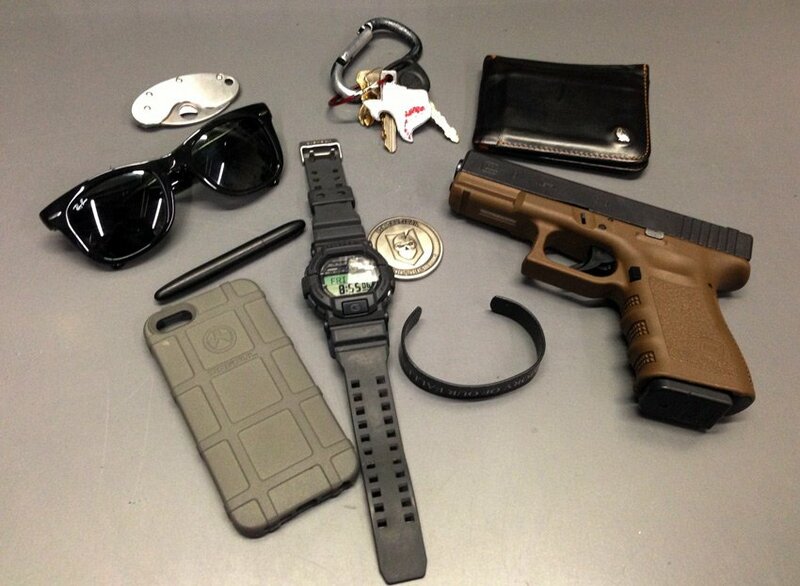 As you probably saw by our announcement today, we want to see what you carry! Well, mainly the stuff that's in your pockets although belt and wrists count. Remember, it has to be functional and realistic. This means it actually has to be what you carry in your pockets, not in a bag. 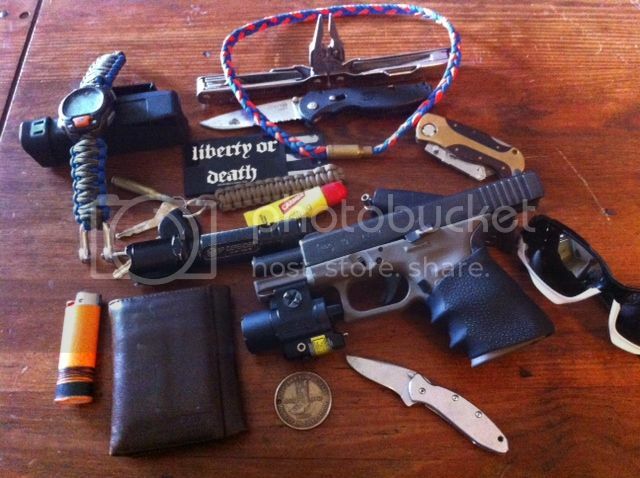 It would be great to see a brief description or bulleted list of what you're carrying too. We're going to let this contest run for two months and we'll pick two winners from the pool of submissions. The winners photos will be posted on the homepage of ITS Tactical along with the announcement. Don't know how to add a photo to your post? Follow this How To guide. Submissions will be judged by The ITS Crew based on creativity, realism and functionality. Past contest photos are not eligible. Take a new photo and make it look good. Get creative! Your Forum profile must include a profile photo. In the case of OPSEC, it doesn’t have to be a photo of yourself, just something other than the default “no photo” image. By sharing your photo and submitting your entry, you agree to allow ITS Tactical to display that photo in a post on the itstactical.com homepage if you win. You still hold all rights to the photo. Edited by Savoy6, 05 August 2013 - 11:22 AM. Edited by TrojanTau, 05 August 2013 - 11:28 AM. 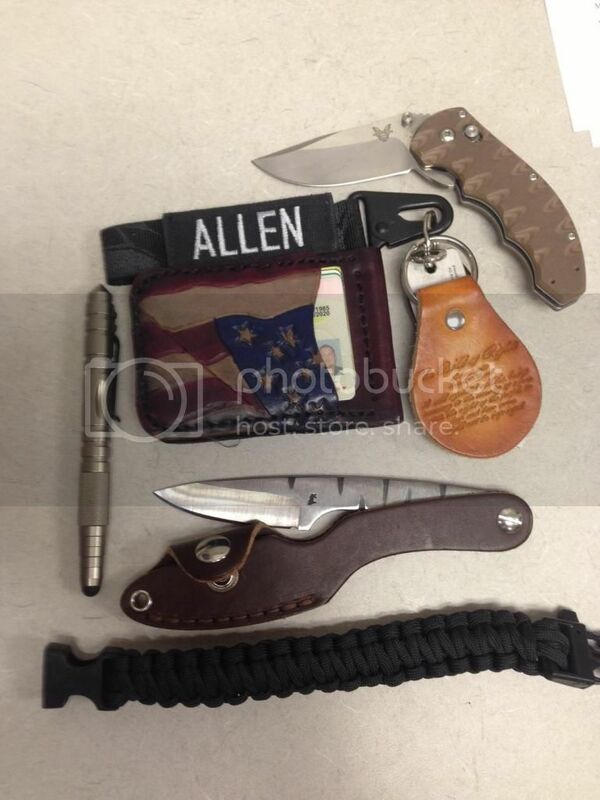 Here is my current EDC well MDC as in Most days carry when I am going to work most of this can't come along as its not allowed on base. I dont have fancy photos but I just plopped it down on my desk after I saw the call for submission. Nothing fancy just work horses. M42 with trigger job and grip safety removed. (I have this thing on my person 97% of the time) / always carried with a speedstrip and usually a speedloader or two. Kershaw Something or other. Nice beater that holds up. In my work bag I keep a CAT, combat gauze and some other odds and ends. Not much in my pockets or on my person, I drag around an Arctery'x Khard 30 with me. I forgot about the little Streamlight pen light and a pair of nitrile gloves I have that didn't make it into the photo. 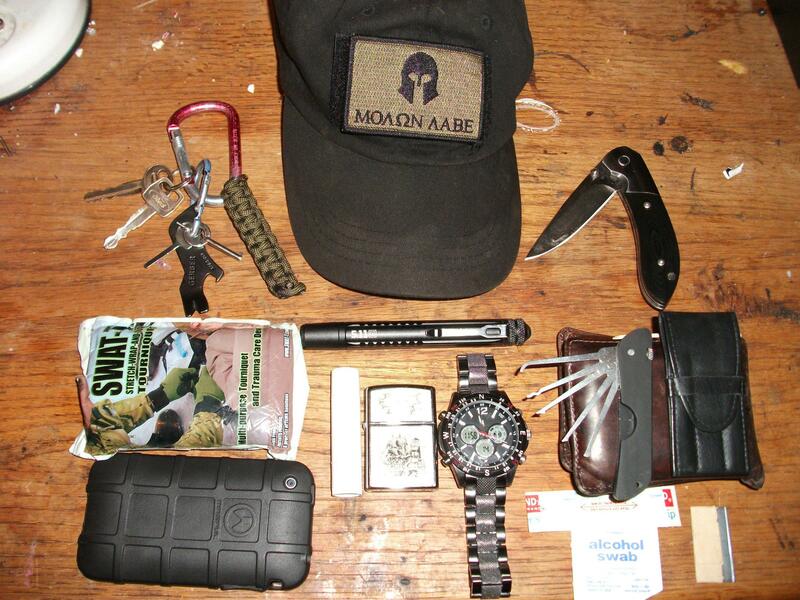 Condor warfighter gloves, Shemege, and devil dog belt. 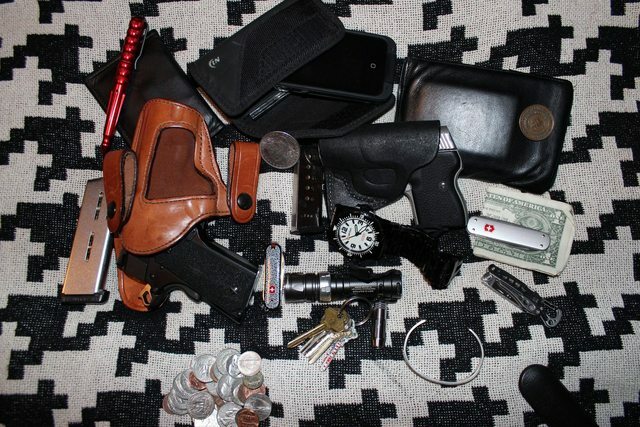 My EDC & Pocket Dump, Benchmade Pen, ID Case, Compact 1911 & spare mag, change, iphone lifeproof case & holster, 1896 Morgan Silver $, NAA .380 pocket holster & spare mag, Zenton Watch, JetBeam RRT light, Swiss Army knife, house keys, Quantum D2 light, Wallet with no money, Big Penny, Swiss Army money clip, Leatherman tool, and bracelet. Lastly my Type 1 Diabetic supplies. 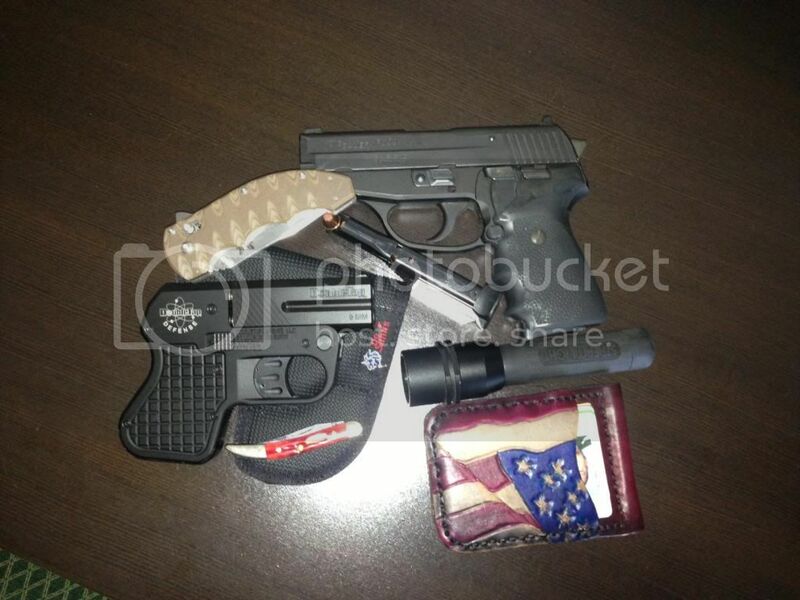 Ruger P95DC, spare mag, comp-tac holster, g-shock, keys, cold steel recon 1 spear point tanto, 5.11 atac L1, aluminum wallet, EMT-B cert, charter arms undercover .38+p, blackhawk leather holster, speed loader, para-cord bracelet, hornady critical duty 9mm+P, hornady critical defense .38 SPL+P. thats my EDC. holsters and firearms vary by day but those are the 2 that i usually carry. Sure seems like a lot now that I typed it, 5.11 tac lite pants have excellent storage capacity tho!